The second onedayer at Delhi was won in a very convincing manner made the Indian fans rejoice. Before the match commenced, Dermot Reeve enquired Sourav Ganguly on field of the pitch. The views of Ganguly, Gavaskar, Venkatesh Prasad and host of others was the same – a dry batting pitch with not much of bounce and movement…. – hence a tall scoring 100 over match was what one was looking forward to.. Feroz Shah Kotla behaved much differently ! This is a famous political ground, not because it is situated in Nation’s capital but more because of the way the DDCA has been run. It was here that Anil Kumble took the famous 10 in an innings against Pakistan in 1999. In 1952 Test against Pakistan, Hemu Adhikari and Ghulam Ahmed were involved in a record tenth wicket stand of 109 runs - a record that still stands. In 1965, S Venkataraghavan, in his debut series, demolished the New Zealand line up with figures of 8 for 72 and 4 for 80. In 1983-84, Sunil Gavaskar scored his 29th century to equal Don Bradman's long standing record for the highest number of hundreds in Test cricket. In 2005-06, at the same ground, Sachin Tendulkar broke Gavaskar's record of most centuries with his 35th Test century. With all that background an ODI between India and Lanka was abandoned in Dec 2009 due to a dangerous pitch. The Delhi High Court stepped in to rule that the no. of complimentary pases for the World Cup 2011 should not exceed 10000 out of a capacity of 41000. The peculiarity of the Indian stadiums is that there will be very high % of people without tickets, add to them the Security personnel and ground staff… one can be sure that the nos. present inside will far exceed the official capacity.. !! Alastair Cook won the toss, elected to bat and soon returned to Pavilion without troubling the scorers – a good catch by Ravindra Jadeja at point off an ordinary ball of Praveen. In the next over, Vinay kumar got rid off Kieswetter and England was 2 down with nothing on board. Another double strike at 121 left them tottering as they were 5 down. Eventually they made 237 which would never test any team on Kotla wicket. Vinaykumar who has not been amongst wickets earlier finished with 9-1-30-4. Indian openers were out cheaply and at one stage they were 29/2 – from then on Gautam Gambhir and Virat Kohli took over. You don’t get to see 200+ partnerships in One dayers. In fact, this has happened in ODIs only 20 times. The highest is the 237* between Sachin Tendulkar and Dravid at Bristol against Kenya in 1999. Of the 20, Indians have featured in 200+ partnerships 6 times – of which Kohli has been part of in 3 occasions !! At Kotla, bowlers performed well. Steve Finn clocked speeds of 150 kmph and beat the batsmen with sheer pace. We have not seen a genuinely fast bowler from India, bowling raw pace and hurrying the batsmen with his speed alone !! 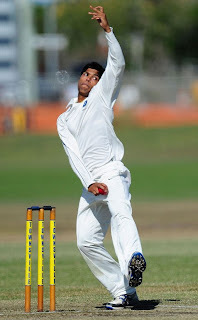 Years back, in a tour of Sri Lanka, the BCCI sent two rookies - Jaidev Unadkat andUmesh Yadav, mainly as net bowlers. On that tour, Sreesanth was down with a knee discomfort and Harbhajan Singh with fever. The 18-year-old Unadkat, had not played much and Yadav had had two seasons with Vidarbha. Umesh Yadav made his debut when India played a depleted side against Zimbabwe and has not been encouraged much thereafter. He should have been played in the excellent swing conditions of England or on the pacier pitches elsewhere. Yesterday he was not given the new ball but was given the bowl after 15 overs. The score card would 4,0,4,0,0,4 – but what would remain unsaid would be the fact that the first ball was 139.0, 3rd 142.6 and 6th 145.5 – he was all over the place, but was making impression with his genuine pace.. back again in the 24th over, his 3 deliveries exceeded 141; at 25.2 his 142 kmph took the edge of Pietersen; at 41.4 had Samit Patel with another one of 143.0 kmph. He is less than 24 years of age and should be nurtured properly. On very many occasions, the selectors had chosen to announce the squad in the midst of a match. Yesterday, the Squad for the remaining 3 one days was announced. The Selectors have retained the same squad and thus the players for the remaining One dayers are : : MS Dhoni (capt and wk), Gautam Gambhir, Virat Kohli, Ajinkya Rahane, Suresh Raina, Parthiv Patel, Ravindra Jadeja, R Ashwin, Praveen Kumar, Vinay Kumar, Umesh Yadav, Manoj Tiwary, Varun Aaron, Rahul Sharma, S Aravind. - when will Varun Aaron get a chance to display his wares is the Q now ?? For the solitary T20, there is some surprise. Robin Uthappa has been recalled after more than 3 years of wilderness and Yusuf Pathan also makes a comeback. The Twenty20 squad: MS Dhoni (capt and wk), Suresh Raina, Ajinkya Rahane, Virat Kohli, Yusuf Pathan, Robin Uthappa, R Ashwin, Ravindra Jadeja, Praveen Kumar, Vinay Kumar, Umesh Yadav, Manoj Tiwary, Rahul Sharma, S Aravind.